Syreeta Wright is an immense talent who seemed to fall through the bureaucratic cracks of Motown Records, the label where she spent 15 years. Often compared to her other pleasantly shrill-voiced peers Deniece Williams and Minnie Riperton, Wright is unfortunately best-known for a non-musical accomplishment -- being the wife of Stevie Wonder in the early 70s. But Syreeta's association with Mr. Wonder helped create some bright musical moments. She co-wrote several of his tunes including "Signed Sealed Delivered" and "If You Really Love Me" (on which she is a featured vocalist), as well as The Spinners' "It's a Shame." Her career didn't begin and end with her former husband either. Berry Gordy Jr. recommended that she replace Diana Ross when Ross left the Supremes. (For some reason, he changed his mind soon after.) And she had her first real hit in 1979 with a ballad/duet with Billy Preston called "With You I'm Born Again." 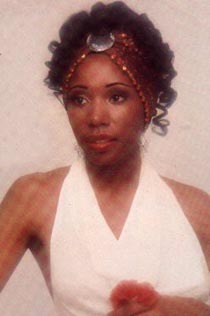 Throughout the 70s and since then, Syreeta has been an in-demand session vocalist with several jazz and R&B projects. This month's feature song is culled from her days as a newlywed with her famous then-husband. Arranged, produced, and penned by Wonder, "Black Maybe" (from her debut album) is a conscious-colored tune, gloriously moody and meaningful. The perfect introduction to her work. Hope you like it. Did you like this month's feature song? Rate this month's feature song on a scale from 1-5, 5 being best.